We present, for the first time, a general strategy for designing ARX symmetric-key primitives with provable resistance against single-trail differential and linear cryptanalysis. The latter has been a long standing open problem in the area of ARX design. 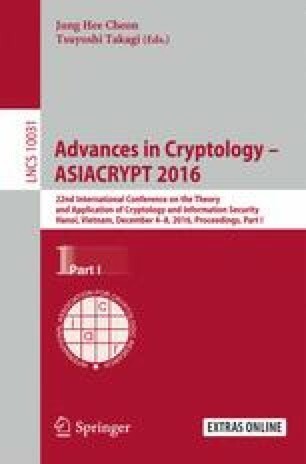 The wide-trail design strategy (WTS), that is at the basis of many S-box based ciphers, including the AES, is not suitable for ARX designs due to the lack of S-boxes in the latter. In this paper we address the mentioned limitation by proposing the long trail design strategy (LTS) – a dual of the WTS that is applicable (but not limited) to ARX constructions. In contrast to the WTS, that prescribes the use of small and efficient S-boxes at the expense of heavy linear layers with strong mixing properties, the LTS advocates the use of large (ARX-based) S-Boxes together with sparse linear layers. With the help of the so-called long-trail argument, a designer can bound the maximum differential and linear probabilities for any number of rounds of a cipher built according to the LTS. To illustrate the effectiveness of the new strategy, we propose Sparx – a family of ARX-based block ciphers designed according to the LTS. Sparx has 32-bit ARX-based S-boxes and has provable bounds against differential and linear cryptanalysis. In addition, Sparx is very efficient on a number of embedded platforms. Its optimized software implementation ranks in the top 6 of the most software-efficient ciphers along with Simon, Speck, Chaskey, LEA and RECTANGLE. The work of Daniel Dinu and Léo Perrin is supported by the CORE project ACRYPT (ID C12-15-4009992) funded by the Fonds National de la Recherche, Luxembourg. The work of Aleksei Udovenko is supported by the Fonds National de la Recherche, Luxembourg (project reference 9037104). Vesselin Velichkov is supported by the Internal Research Project CAESAREA of the University of Luxembourg (reference I2R-DIR-PUL-15CAES). The authors thank Anne Canteaut for useful discussions regarding error correcting codes.